Quasar 3C 273 in Virgo. The redshift of a distant object is measured by comparing the absorption lines or emission lines of that object against a known reference. I chose to use the star Theta Leonis (spectral type A3v) as a reference due to its easily recognizable Hydrogen lines. Quasars are known to have strong emission lines of Hydrogen (both Alpha and Beta in the Balmer Series). 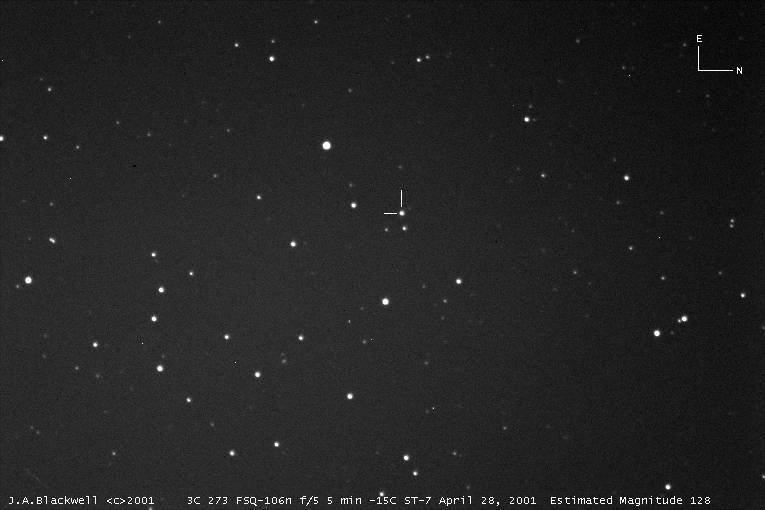 The spectra of both objects were obtained the same evening using identical circumstances: temperature of the CCD was steady at -20C, the telescope was a Celestron 8 (200mm) operating at f/6.3. The focus was not altered between images. Once obtained, the spectrum of Theta Leonis was calibrated using VSpec software using the Hydrogen Beta line at 4861.33 Angstroms and the 0-order image of the star for reference. Once calibrated, the number of pixels per Angstrom is known (17.49756 A/p). By measuring the position of the quasar’s 0-order image from its Hydrogen Beta emission line in pixels, we can determine how many Angstroms the line has been shifted towards the red end of the spectrum. The distance to 3C 273 depends upon the value of Hubble’s Constant (H). If H is assumed to be 75km/s/Mpc, then 3C 273 resides some 2 billion light-years away. If H is assumed to be 60, then 3C 273 resides some 2.6 billion light-years away. At such a distance, objects have their light dimmed by 38.9 magnitudes! In order for us to even see 3C 273 means that it must be incredibly bright. Latest estimates point to 3C 273 being as bright as 2 trillion (1012) of our suns! That would make it as bright as 100 times the combined light of all the stars in our Milky Way Galaxy.